TV antennas have undergone amazing technological developments. Designers of it have already modified its look, size, and most importantly, its performance. 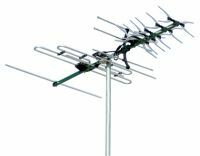 From just the mere roof top antenna in the TV room, there have been plenty of innovations in the antenna and modern antennas already make it possible for us to enjoy watching crisp and clear shows without the occasional rain static that used to annoy us. Our antennas cover metropolitan and most regional areas! Browse our Digimatch Antennas now while tfree shipping Australia Wide is ongoing!